Malia Obama deserves congratulations. Admitted to Harvard University, she has decided to take a gap year, a mature choice that many students make when they want a break between intense and competitive studies and college. This is a great time for her to take a gap year. After these eight years in the White House as a “First Daughter”, she now has a chance to enjoy life and pursue some of her non-academic interests. She speaks fluent Spanish, so perhaps she’ll take some time to travel to Mexico, Cuba, or Spain. She is interested in television and film, so perhaps she’ll work as a production assistant (or even a commentator) on a television program. She may be interested enough in politics to volunteer for some down-ticket candidate. Imagine the boost she could give to California Attorney General Kamala Harris in her Senate race this fall! It is going to be interesting to see how this young woman’s life unfolds. In reaction to Malia’s good news, the racists are out in full force. According to the website AddictingInfo.org, the Fox crew was so vitriolic that Fox had to close down a page due to the volume and negative comments regarding her announcement. The content of the messages hardly deserves reprint, but it is no surprise that the beautiful young lady was called a “monkey,” not to mention the “N-word” and worse. She was admitted because of affirmative action, several wrote. Every stereotype one can imagine was heaped on this young woman. Come on people! Malia Obama won’t be 18 until July 4. She’s a kid. Dislike President Obama and his wife, Michelle, if you want to. Call them names – I am sure that by now, ugly name-calling affects them as much as water rolling off a duck’s back. But it is especially vile for racist haters to direct such ire to a young woman, who is really just a girl. Perhaps some feel she has no right to innocence because she lives in the White House. But it’s heartbreaking to bear witness to the venom this young lady has attracted. While it is heart breaking it is hardly surprising. Hatred seems to be the winning ticket in our nation. That Donald Trump is the presumptive Republican nominee for President is frightening. He won by dominating a large and crowded field, winning primaries and delegates when some thought he had little chance and even less organization. He’s thrown more than $30 million of his own money into this race, so far, and is likely to spend millions more even as he begins to stump for contributions. His winning platform has been to insult any and everyone, from Mexicans (“rapists”), Muslims (moratorium on entering the country), his opponents (Lying’ Ted, Little Marco, and more), Hillary Clinton (Crooked Hillary, “screeching” Hillary, playing the “woman card”), to all the women he has insulted (taking swipes on everything from their looks to their bodily functions). The “Stop Trump” movement was too little, too late. Apparently, the plurality (not majority) of primary voters want a blustering, bullying, braggart to lead our nation. And judging from the abhorrent comments Malia Obama’s success has garnered, there are many who would emulate Mr. Trump with his vile meanness. How has meanness and racial resentment become the order of the day? Whatever happened to civility? What happened to the adage that if you have nothing kind to say, say nothing? What happened with being glad for a young person who has been admitted to college? What happened to disagreeing about issues, but not about personalize. Why does the size of one’s genatalia become a debate point in a presidential election? People are now talking about ways the Republican Party might heal. How does our nation heal? Republicans don’t own a monopoly on meanness. I was appalled that Secretary Hillary Clinton and Senator Bernie Sanders went after each other like mortal enemies, shouting over each other, bandying hostile accusation, and generally behaving as if they were auditioning to lead the Republican party in style, if not content, when they last debated. They’ve both calmed down, perhaps realizing that they have much more in common than not. Indeed, Hillary Clinton owes Bernie Sanders a “thank you.” His candidacy has appropriately pushed her to the left, especially on issues of economic justice, and made her a much better candidate. I don’t ever, ever, ever want to hear the word “post-racial” again. Comments directed toward Malia Obama suggest that our nation is pre-civilized, not post anything. The hate directed at a young woman, and the hateful rhetoric that has characterized the Trump campaign are two sides of the same coin. Where do we go from here? 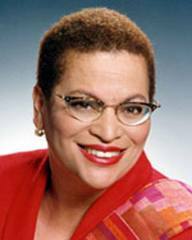 Julianne Malveaux is an author and economist based in Washington D.C. Her latest book, “Are We Better Off? Race, Obama and Public Policy” is available at Amazon.com and www.juliannemalveaux.com. Do You Know the Difference between “Real” Black Republicans and Sellouts?